Shopping locally supports local families. When you shop at Bartlett’s, you are helping support 36 full time year-round employees and over 100 seasonal employees. You can find everything you need to prepare meals, entertain guests, or decorate your home or table. Locally grown food tastes and looks better. Our crops are picked at the peak of freshness and travel less than one mile to get to the market. The produce that we don’t grow is usually sourced from sustainable and regional businesses. Local food is safe. We aren’t anonymous and we take our responsibility to you seriously. We want you to have a great experience from the minute you walk in the door! Buying local is an investment in the island. Bartlett’s Farm helps to support at least 45 local charities every year. 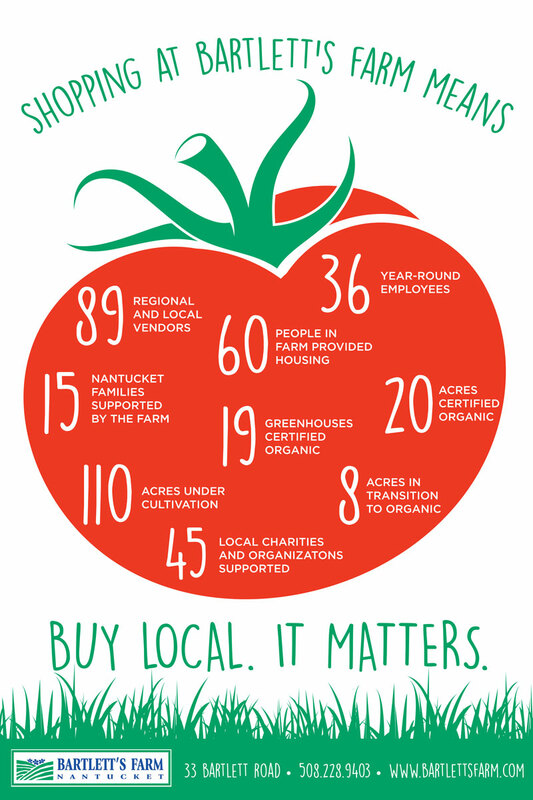 Buying local makes you part of the community. The relationship between consumer and farmer is time-honored connection that gets stronger with each generation. Bartlett’s Farm gives you and your children and your grandchildren a place to learn about nature and agriculture. Local food preserves open space. Bartlett’s has permanently protected over 100 acres of farm property to assure it will never be developed. Enjoy the wide open views as you walk, bike or drive out to the farm. Local food benefits the environment and wildlife. Our commitment to being stewards of the land is evident by our continued transition of more and more acres to become certified organic.